Soda taxes are regularly being promoted and described as "fat taxes", "sin taxes" or "obesity taxes". They're none of those things. Yes, the calories in soda are a real and likely player in our growing rates of obesity....and so are the calories in a great many other foods. Taxes on sodas are meant to discourage an unhealthy behaviour - drinking boatloads of sugar. That's a bad plan both for people with, and for those without obesity. The World Health Organization has recommended that no more than 10% of everyone's daily calories come from added sugars. In regard to added sugars, sugared soda's certainly the most clear and present target, and especially here in Canada where medicine is socialized, discouraging behaviours that contribute to the burden of disease (and hence healthcare expenditures) is certainly in the Government's purvey, and hence the consideration of a soda tax. So I think a better definition would be an, "unhealthy indulgence tax", which is the same way I'd describe tobacco's taxation. But will a soda tax actually help decrease the burden of chronic disease? No one knows. Some mathematical modeling has suggested it will, but even the best models can't truly predict real world behaviours. For instance, in this model they predict that 40% of the calories no longer consumed consequent to the tax would end up being consumed in increased milk and juice calories. But what if Big Beverage jumped on the tax to more heavily market juice? Given their job is to make money and given that every soda company worth its salt also sells juice, I wouldn't bet against that marketing. If the calorie and free sugar reduction disappears in the consumption of non zero-calorie beverage alternatives to soda, then the benefits of less soda would also disappear. And what of the dollars raised? Is there any assurance that those dollars would be spent on healthcare? I remember a similar promise here in Ontario where the Liberal Government implemented a Health Care Premium that was promised to help fund the health care system but ended up funding water infrastructure. Oh, and one last thing. Sometimes folks argue that this tax would be punitive to the poor. It's true that the lower your income, the more impacted by a tax you would be, but some perspective might help. First, the cost of a soda with inflation adjusted dollars has dropped 33% since 1978 (see chart up above) and most folks are recommending a less than 33% tax on the stuff. Second, on average we're all consuming 3x as much soda as we did back in the early to mid 1960s. 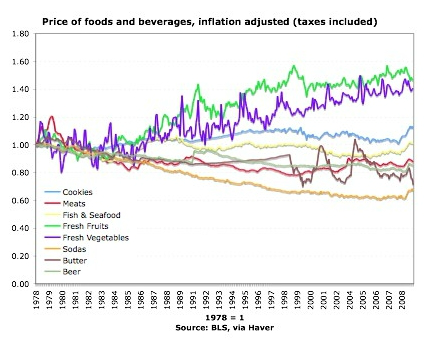 So whatever a person is currently spending on soda, if that person continued to spend the exact same amount, but soda prices rose by 33%, on average that person would still be consuming double the per capita soda consumption of the mid 1960s. Double the soda consumption of the mid 60s doesn't sound too cost prohibitive to me. So am I pro soda tax? Yes, but cautiously. I say cautiously because of all those questions up above, and because I wonder about these sorts of taxes actual implementation. Ideally soda taxes would be rolled out with public education campaigns that talk of liquid calories, and ideally too, it'd be a tax that would apply to all sugar sweetened beverages (including both milk and juice). I'm not too confident those criteria would be met. But I'm supportive because at the end of the day, whether you have weight to lose or not, drinking less sugar is likely in our health care systems' best interest, and sugar sweetened beverages are by far the biggest, sweetest target.